There’s no better place for a crate motor than in a boxy car and today’s Nice Price or Crack Pipe Volvo is just about the boxiest. Let’s see if its price makes it a square deal too. Well, I guess we’ll stick to not doing many project cars around here as yesterday’s 1973 Citroën GS1220 project couldn’t even find favor as a cheap but intriguing lawn ornament. A 68% Crack Pipe vote sealed that Cit’s fate, and perhaps the extended stay in the Pacific Northwest will seal its doom. Now, let’s look at a car that seems to have been given a new life. In the classic grindhouse flick Sleepaway Camp people keep dying and the main protagonist hides a very dark (and dangly) secret. 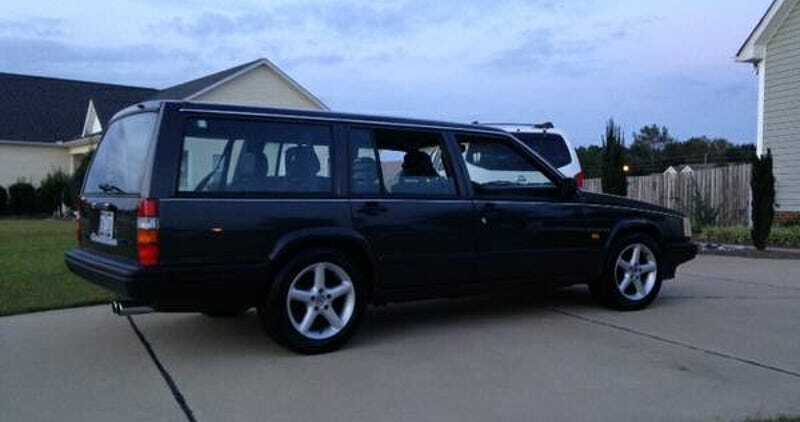 Similarly, this 1990 Volvo 740 wagon has a killer secret - a Cobra crate motor - and that makes it a sleeper, and that probably makes many of us happy campers. We’ve seen V8-powered Volvos here before and in fact I had to check to make sure we hadn’t actually seen this one here back in the day too. It appears we have not. I’m pretty pleased to see it now since it melds together two of my favorite things: boxy wagons and Ford V8s. The present owner is not the instigator of this V8-equipped Volvo, but he says he brought it back to life after the previous owner parked it due to a bum fuel pump. That pump feeds what’s described as a Ford Motorsport small block create mill. It rocks 306CID and a claimed 340-bhp. That breathes through a Cobra intake and aluminum heads, and exhausts through two and a half inch dual pipes that are claimed to be less than six months old. Backing up the hot snake is a T5 fed through a Ford Racing King Cobra clutch. Brakes are larger than stock, and the suspension has gone poly in the front. Wheels are AT Italia 16-inch five-spokes. Typically when a swap like this is made you’d expect that there would be some old parts that refuse to talk to the new parts. With the exception of the odo, that doesn’t seem to be the case here. The ad notes that the gauges work, and that the car even has working A/C. It doesn’t just sound impressive, it seems to look pretty good too. There’s a respray in the factory grey metallic and a switch to 760 headlamps and turbo grille. Aside from the twin tip exhaust, there’s no tip off to what’s going on under the hood here. Inside is equally tidy. The seller says that the original leather seats have been replace by cloth units, and aside from the droopy drawers back of the seat pockets they seem to be in fine shape. the dash appears free of cracks or other boogers and you get a nice three-spoke Momo tiller and huge cue ball to play with while you’re in there. The seller says that there is about 15,000 miles on the swap, and that all the kinks have already been worked out. What he doesn’t say is why he’s selling it, but seeing as he has just been the car’s custodian for a time, and not its builder, it’s easy to assume that he’s just ready to move on to the next great adventure. To take on this adventure you’d need to come up with $10,000 in cash. What do you think, could a nicely sorted and well-kitted V8 Volvo command that kind of cash? Or, is this Cobra-powered car’s price just not within striking distance? H/T to anonkc for the hookup!